In the high-tech world of the modern Vegas sports book, there are no gray cubicles and the unexpected is always expected to happen. Come take a rare behind-the-scenes look with me. 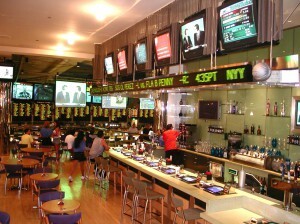 Photo courtesy of Harrah's Corp. This week I had the good fortune to meet the Specialty Games Manager for Bally’s and Paris Las Vegas, Frank Kunovic III. He graciously answered an array of questions about sports book, poker and keno operations for the two Harrah’s properties over lunch and then took me behind the scenes for a closer look. For this sports fan, making the meeting by hydro-planing on the I-15 during a visibility impaired Mojave thunder burst was a distant second for the highlight of my day! A life-long sports fan, Frank got his start back in Crestwood, Illinois working at an OTB counter when he was 18 years-old. After college he moved to Las Vegas in 2003 and got a job as a ticket writer at Harrah’s. (a “writer” in the casino sports book world translates to the person you place your bet with who then punches the right keys to print your ticket) He moved up the ranks quickly and after a one year stint as the Specialty Games Manager for Harrah’s Laughlin, he was offered the position at Bally’s Las Vegas in July 2008. Operational responsibilities at Paris Las Vegas quickly followed. Harrah’s is well-known for promoting from within and Frank is convincing when he says he loves his job. keeps players up-to-date on all their bets. Bally’s has anchored the southeast corner of Flamingo Road and Las Vegas Blvd. for many years, but it is a completely modern sports book. 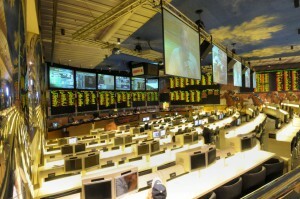 Complete with a VIP “sky” box and TWO digital screens at every seat for horse-racing fans, Bally’s is one of the most modern sports books on the Strip. Frank told me it generally takes a little more than a dozen people to run a satellite sports book on the Las Vegas Strip and a big part of the Specialty Games Manager’s job involves employee training, keeping morale high, fielding customer questions and making sure his VIP guests have everything they want. Bally’s prides itself on customer service and has a loyal customer base to prove that a friendly smile and helpful advice keeps people coming back. Another important part of his job is to make sure his floor supervisors are aware of any special events, promotions or guests. He said he sees the highest volume of wagers come in during the NCAA college basketball tournament (“March Madness”), followed by the Super Bowl, the NBA and MLB seasons. He told me the Chicago Cubs to win the World Series is consistently the most popular future bet and has been for many years in a row. Ahh, the Cubs. Don’t get me started. Aside from operations in the sports book, Frank and I also talked about trends in the poker world and whether the advent of keno slot machines has impacted the popularity of live keno. In regards to the latter he told me the games attract two different sets of clientele so there has been little change in the popularity of live keno. This makes sense since traditional slot players might be attracted to a “new” slot machine, but traditional keno players who like to watch their numbers pop like popcorn on white ping-pong balls in the air tumblers aren’t likely to find the same thrill on a slot machine. In regards to poker trends, Frank admitted he has started to see a few. Namely, the increasing popularity of the (now) Harrah’s owned World Series of Poker (WSOP) fills every room in Bally’s every July. Secondly, the popularity of lower buy-ins for qualifying tournaments has been attracting new players to the game and Texas Hold’em is starting to get a run for its money at some casinos (although not as much at Bally’s) from Omaha Hi/Lo. Although all ten poker tables at Bally’s are “generally full 24/7” during the WSOP, if you can’t handle the crowds at the Rio (where the WSOP has been held for the last three years), take a short walk down Flamingo and wait for a table at Bally’s. Look for a big guy shaking every one’s hand and tell him I sent ya’! If you haven’t stopped by Bally’s in the last few years, you’re going to be surprised by what they have to offer. Wow that mural of the race horses is very cool — they almost look real…. Good info & entertaining too. Frank must be a good guy if he’s from Crestwood, IL. I used to hang out there to watch my high school hockey team play.